A major road through Southbank will have the number of lanes for cars cut in half and the space for vehicles replaced with parkland, under a long-promised Melbourne City Council plan that begins construction on Monday. 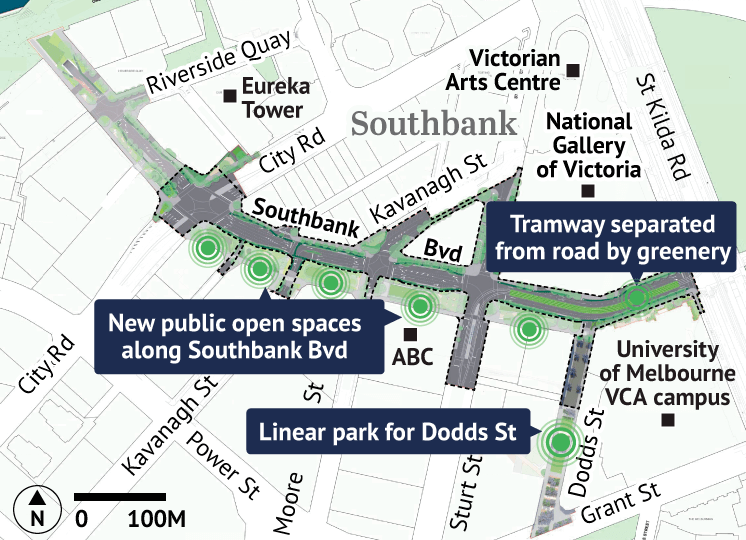 Southbank Boulevard will become the “green spine” of the Melbourne Arts Precinct, with the road to be converted into what acting Lord Mayor Arron Wood said was “the most significant linear park in Melbourne”. The road will be shut between St Kilda Road and Sturt Street from Monday, July 16, with the project due for completion in August next year. It is the latest under-utilised stretch of inner-city road to be replaced by park, with two separate streets in North Melbourne being turned into green space in recent years. The $35 million Southbank project will open up 2.5 hectares of new public space, much of it in front of the ABC studios on Southbank Boulevard and behind the Victorian College of the Arts. There will be 87 trees cut down for the project along the length of Southbank Boulevard, with a council fact sheet saying there would be a total of 300 new trees planted to replace them. The project will provide more space for pedestrians and dedicated lanes for cyclists. “One million people come into the city every day and 90 per cent are on foot, so we have to continually look to make it more pedestrian friendly,” Cr Wood, said. Traffic figures show that daily car numbers have declined on the boulevard from 40,000 two decades ago to 13,000 in 2015. Trams will be hit next month by the works, with a section of track out of service for a week in late September. Throughout the year-long redevelopment, cars will have limited access to the road but bus routes will be diverted. Trams will continue to run through the project, except for the nine-day shutdown in late September. The project also looks to pilot plantings in the space between the tram tracks, which will see a “pigface” ground cover planted that will also bloom with flowers. It follows a number of European cities that in the 1980s lined their tram tracks with grass as a way of greening areas.